I cannot begin to describe the kind of elation and happiness I am feeling, coming home to Finland last night as the very first SMASH Wrestling Champion in Japan, defeating one of my greatest opponents ever, “The Japanese Buzzsaw” Yoshihiro Tajiri in the finals of the SMASH title tournament on Friday night, October 28 at Korakuen Hall in Tokyo. I have faced Tajiri several times in the past in both Finland and Japan, and every time our matches have been hard, physical clashes. This final match last Friday night in the SMASH Championship tournament finals was no exception. No, this one was WAY harder than ANY single one of our past, classic encounters. We all know that many critics of professional wrestling vocally criticize our game as being “fake” and/or theatrical. I find that kind of slander disparaging, and I would love to have those same critics step into a Japanese wrestling ring and feel the kind of punishment that we experience as professionals inside of that squared circle. That said, my match against Tajiri on October 28 was one of the stiffest, most hard-hitting, SMASH-mouth affairs of my career. 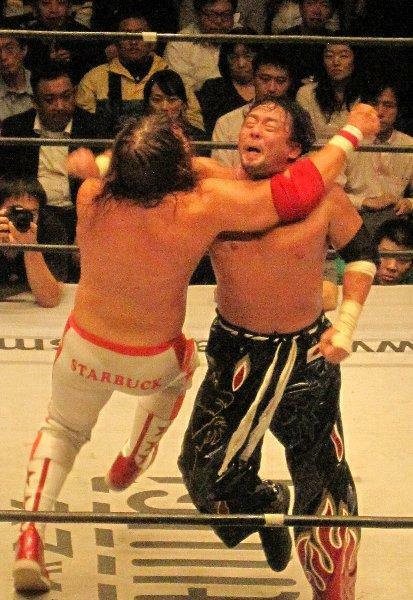 Tajiri’s trademark kicks were brutal and his forearms and punches rocked my jaw. I have to believe that “The Japanese Buzzsaw” felt the same at the other end of the equation, as the fighting spirit in our championship final bout was most definitely REAL. Neither one of us held anything back, as we traded offense and fought a very even bout, going back and forth, neither competitor really gaining a clear-cut advantage over the match that lasted 15:12 before I dropped Tajiri with two vicious spike piledrivers after just barely kicking out of his Buzzsaw Kick. After the match, both of us just lay on the mat, wasted from the physical toll of our bout. Both of us took – and dealt out – one hell of a beating to one another in the quest to become the first-ever SMASH Wrestling Champion. Both of us gave it our all, and I can only very humbly say that I am honored by my huge title win over a tremendous opponent in Yoshihiro Tajiri at SMASH.22 this past Friday. I have the highest respect for the man that I pinned to become the new SMASH titleholder, and I will always remember the night of October 28 at Tokyo’s Korakuen Hall. A huge THANK YOU to: the tremendous Japanese SMASH Wrestling fans for believing in me; to the SMASH office for the spotlight opportunity; to Tajiri for an incredible match; and to my Great God in Heaven and Lord Jesus Christ who makes all things possible (Philippians 4:13).